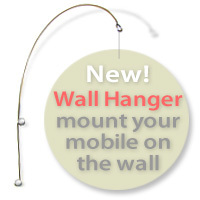 Now you can mount your mobile on the wall. With this easy to install hanger, you can hang any small to medium size mobile approx. 9" off your wall. Perfect if your ceiling is too high. All stainless steel bar, with your choice of white or black hinged screw cap covers. Comes with instructions, screws and wall inserts (for sheet rock walls). You may request a custom size for larger mobiles.... email me.